Tomorrow we’re dropping the suggested retail price for Zune to $199. It’s part of the normal product lifecycle, something we’ve had on the books for months. We just got some research back and customer satisfaction with the 30GB device is really high (around 94%) and we expect even more consumers will now want to discover the Zune experience at the new lower price. 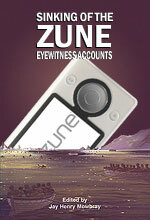 The Zune has already been available at many places for $199, so this is likely to drop the online price even further. Fire sale – nobody’s buying them!